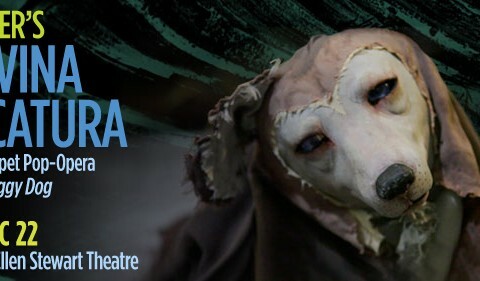 Nearly 40 years in the making, Lee Breuer’s magnum opus, a Bunraku Puppet Pop-Opera with live music from Motown to Broadway, reggae to raga, features our heroine, Rose the Dog, and her mad love affair with her master John. St. Ann’s, La MaMa, piece by piece, Mabou Mines and Dovetail Productions – all ardent supporters of the “bad boy of avant-garde theater” (Village Voice) – unite to complete Breuer’s epic Animationsseries. Featuring Bernardine Mitchell, with OBIE winners Maude Mitchell, Karen Kandel, and Greg Mehrten; the Tony-nominated Paul Kandel; Daniel K. Isaac; John Margolis; and Terry O’Reilly. The musical score is by Lincoln Schleifer, with pop songs and original compositions incorporating the work of Breuer collaborators Bob Telson and John Margolis. The music will be performed by a live band, a quartet of male soul singers, “The Poppers” (Ben Odom, Gene Stewart, Lee Williams and Roy Bennett); a trio of female backup singers, “The Wild Women” (Maxine Brown, Beverly Crosby and Sherryl Marshall); and members of the cast. La Divina Caricatura is supported in part by the National Endowment for the Arts American Masters and The Jim Henson Foundation. A comic spectacle… an acid-trip collage of philosophy, mythology, and lyric poetry.